Susanne Vielmetter Los Angeles Projects is pleased to present new paintings and three-dimensional works by Iva Gueorguieva in galleries 3 and 4. 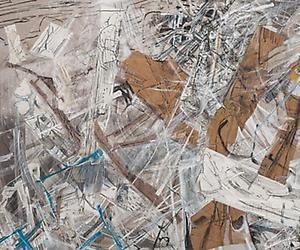 Gueorguieva's work, while simultaneously indebted to the history of gestural abstraction and distancing itself from that history, is committed to the idea that gesture in painting can carry information that is neither simply graphic nor subjective, but that this gesture can have an active relationship with the real world. The paintings presented in her first exhibition at the gallery started out as ruminations on the landscape. They are based on the construction of a specific field upon which a series of projections take root. These projections layer personal memories, fragments of films and fiction, as well as culturally specific narratives about what the land is. The layering of marks, painterly swirls and colored fields create forces within the composition that act upon each other resulting in a dynamic spin that sends the allusion of landscape and space into sweeping movements. Also on view are sculptural paintings that share the title "Talisman Debris." The title is meant to connect the sculptures to the Land paintings and to turn them into tumbleweeds of material memory. They are the physical leftovers, accumulated in a corner during the making of the paintings. In thinking of the stretchers as skeletons with canvas skin, Gueorgueiva has long been interested in collage and cutting, seeking to explore this bodily dimension of the painting. The featured constructions are developments of the stretcher, where it's no longer compelled to be a flattish rectangle. Referencing a cross between James Dean and dusty depression-era characters from Cannery Row, the sculptures invigorate the painterly mark as eloquently as the paintings do. Iva Gueorguieva earned her MFA from the Tyler School of Art at Temple University in 2000. Recent solo exhibitions include the Pomona Museum of Art, Claremont, CA; Ameringer/ McEnery/ Yohe, New York, NY; Bravin Lee Programs, New York, NY and Angles Gallery, Los Angeles, CA. Her work has been included in exhibitions at Galerie Lelong, New York, NY; the Contemporary Art Museum at USF, Tampa, FL; and at the Pasadena Museum of Art, Pasadena, CA among others. She is the recipient of the Orange County Contemporary Collectors Fellowship for 2012, the California Community Foundation mid-career fellowship for 2010 and the Pollock-Krasner Grant for 2006. Iva Gueorguieva would like to extend special thanks to Emette Rivera of ReMade Studio for his invaluable help in producing the wood elements of the constructions.